Meatballs are versatile dish. 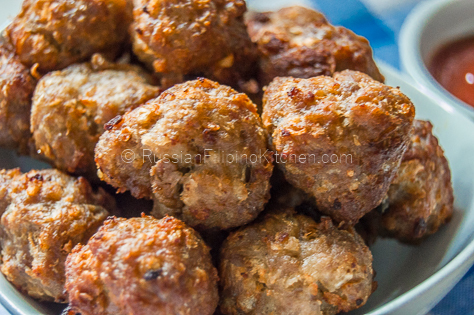 You can make them with any ground meat available and season with any spices you want. Fried, baked, steamed, boiled– who could resist them? For many people, they’re comfort food, including myself. I add them to soups, stews, spaghetti, casseroles, and even use them as pizza toppings. But I also love meatballs as it is , with or without the dipping sauce. 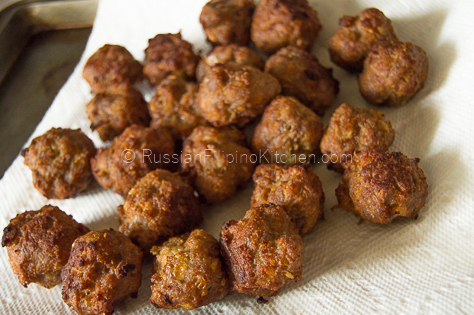 I tried many variations of meatballs but this Filipino-style pork bola-bola (Tagalog term for meatball) stands out for me and is a regular in our menu. Not only I grew up eating them, the simplicity of ingredients and ease of preparation makes it perfect for my busy schedule. And the great part is my picky eaters love them too. I don’t have to trick them into trying it out because they willingly help themselves. 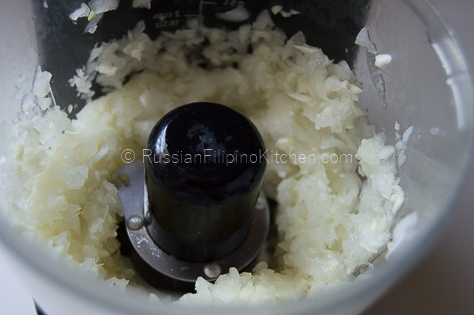 I learned how to make this very simple dish from my mother when I was still in Philippines. It’s one of the first meat dishes that I learned how to cook at an early age. 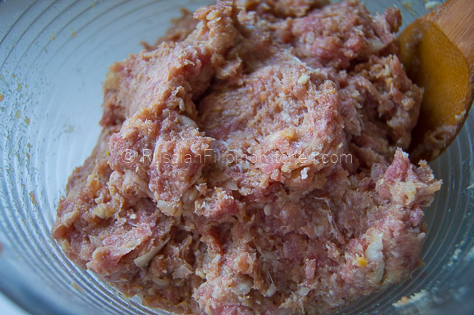 As ground meat wasn’t readily available for sale in our market in the past, I learned how to chop small pieces of pork cuts using a heavy knife and a thick wooden cutting board. That was before the commercial electric meat grinder showed up at the wet market, where we pay a couple pesos to grind the pork and spices together. I’m so thankful now that I can grind my own meat at home using my KitchenAid grinder attachment. Making meatloaf and meatballs became a breeze, and thank God for this wonderful invention! 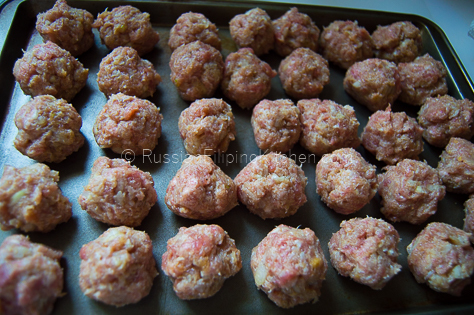 Anyway, you can easily make 30-plus pieces meatballs for this recipe measuring 1 ½ inches in diameter. I prefer 1-inch meatballs because they’re great for tiny hands. They make great appetizers, too! They’re also perfect as base for other recipes like sweet and sour meatballs, Filipino-style spaghetti, and filling for siopao steamed buns. I make these in batches and freeze the rest. 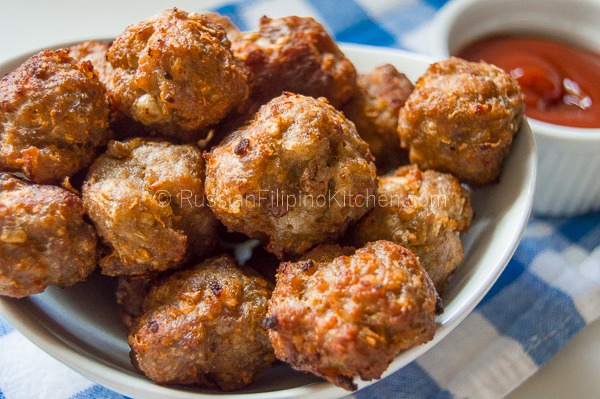 Take note that this recipe is for fried meatballs. If you’re watching calories and want to skip the frying, you can bake them at 400ºF for 15-20 minutes or until cooked through (internal temperature should read 165 ºF and center no longer pink) or steam them for 15-20 over medium low heat. 1. 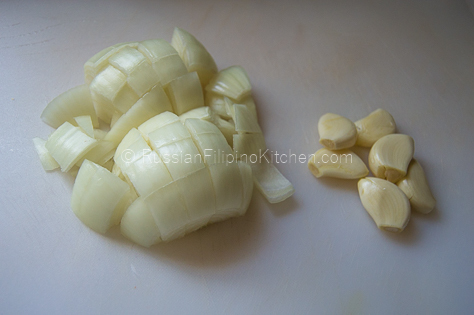 Peel onion and garlic. 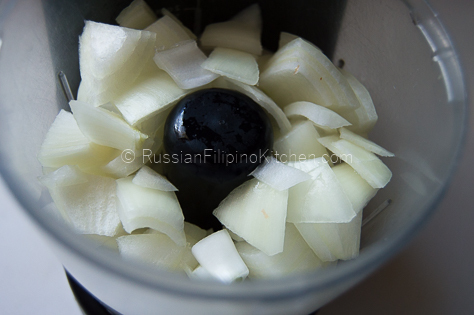 Slice onion into cubes. 2. Place them in a food chopper and chop until very fine. If you don’t have a food chopper, just use a knife and chopping board to mince them as fine as you can. Also, if you have a grater or shredder, you can use that as well. 3. 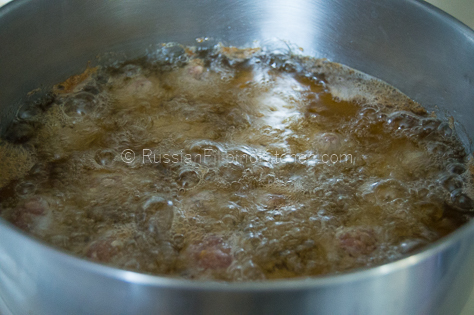 Mix everything together except the cooking oil in a large mixing bowl. It’s best to use your clean hands to do the job to ensure all ingredients are well-combined. 4. 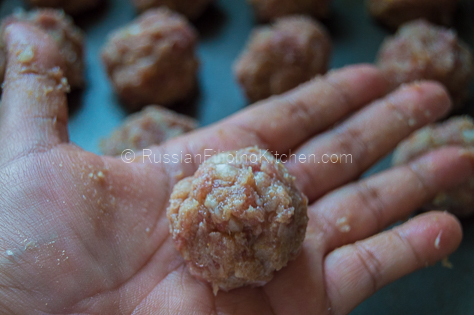 Scoop portion of meat mixture and form into a ball. Set aside. 5. 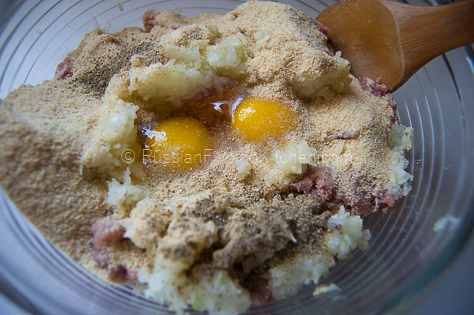 Repeat step 4 till mixture is used up. 6. Heat up oil on frying pan over medium high heat. 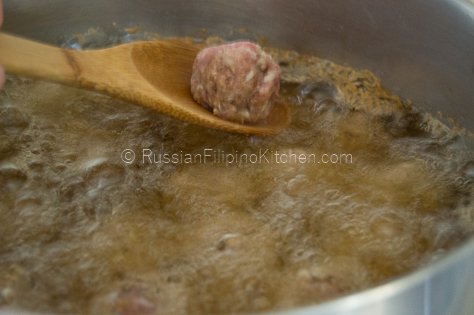 Once oil is hot, carefully drop meatballs one by one. (Test by sprinkling water into the oil. It should be ready when it sizzles). Do not overcrowd the pan. 7. 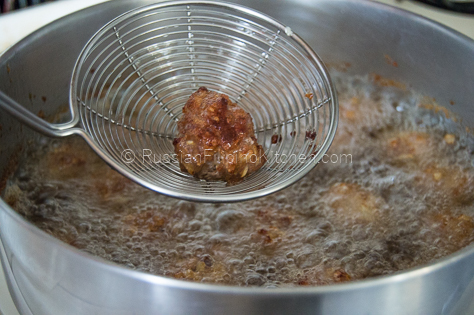 Deep fry till golden brown, about 10 minutes. 8. Drain on paper towels to remove excess oil. 9. Fry up another batch until you’re finished with the rest. 10. 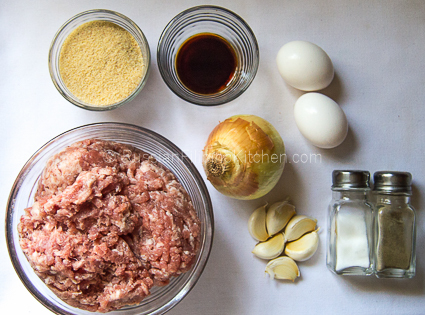 Serve meatballs warm with a dipping sauce. Refrigerate the rest by keeping them in an airtight container or Ziploc bag and freeze for future use. Disclaimer: This post contains affiliate links to products I use and recommend. I get a small commission from the sale to help support this site.